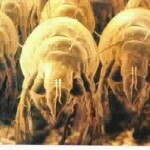 Dust mites are microscope bugs that live on dead skin cells shed from humans and their animal pets. Encase pillows, mattress and the box springs in zippered, allergen-impermeable, dust-proof covers. Covers that permit perspiration vapor transmission will be most comfortable. All bedding — sheets, blankets, pillow cases, and mattress pads should be washed every week or two in hot water (130°F). 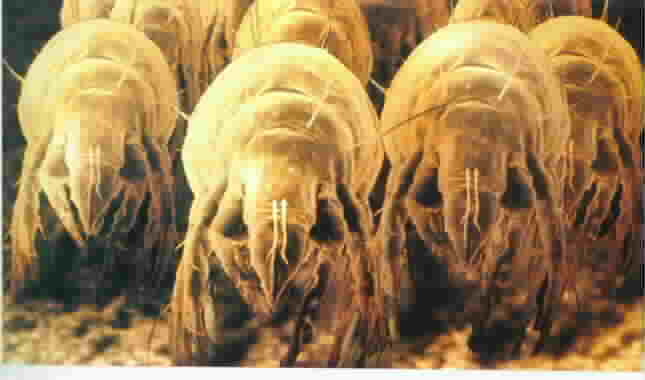 If comforters are not encased in allergen- impermeable covers, they should also be washed every two weeks. Vacuum clean weekly (wear a mask and leave the room for 20 minutes after cleaning). Make sure the vacuum cleaner has a double-thickness bag or a HEPA filter on the air outlet. Carpeting should be removed from the room, and tile, wood, or other non-fibrous flooring should be installed. Use shades or blinds in windows instead of draperies or curtains. Avoid fabric-based wall decorations such as pennants, tapestries, and macrame hangings. Substitute wooden or plastic furniture for upholstered furniture, or choose vinyl or leather furniture that includes an additional allergen barrier. HEPA air purifiers will help further remove allergens in the air of the bedroom. Install allergen-trapping filters in air conditioning/heating systems. Keep all clothing in the closet with the door shut. Clean all drawers and dressers with a treated cloth, and wear a tight-fitting dust mask when performing household cleaning.